The 6th Annual Made In Hollywood Honors recognized La La Land, Moana and Zootopia as this year’s Oscar-nominated features filmed here in California. All three motion pictures carry the distinct designation of having also been scored in Los Angeles by AFM Local 47 musicians. Hosted by L.A. City Councilmember Mitch O’Farrell, the honors ceremony was held on the morning of February 16, 2017, at the Heart of Hollywood Terrace at 1600 VINE, which stands on the historic site of the Hollywood Brown Derby. The MIHH program salutes films nominated for Academy Awards for Best Picture or Best Animated Feature produced and filmed in California. 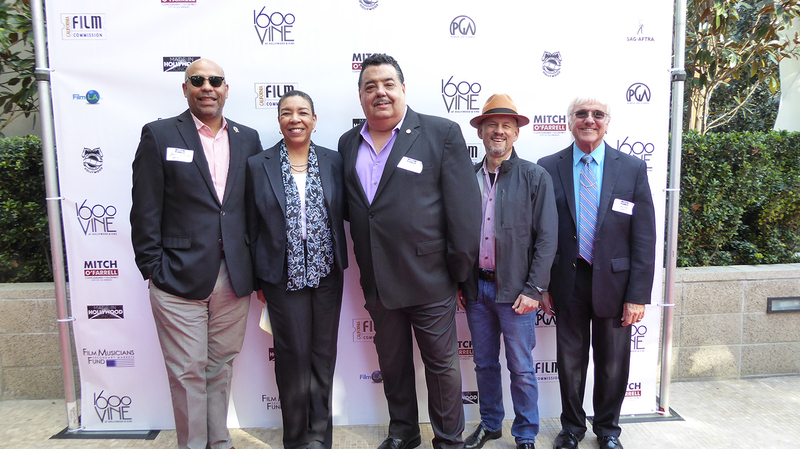 Joined with the City Council in its sponsorship are SAG-AFTRA, California Film Commission, FilmL.A., Teamsters Local 399, the Film Musicians Secondary Markets Fund, and the Producers Guild of America, together with MIHH partner and co-sponsor, 1600 VINE and its managing partner, Klein Financial Corporation. Representing the Los Angeles musicians union at this year’s awards ceremony were AFM Local 47 President John Acosta, Vice President Rick Baptist, Secretary/Treasurer Gary Lasley, EMD Administrator Gordon Grayson, Communications Director Linda Rapka, and Recording Musicians Association International President Marc Sazer. AFM Local 47 composer Justin Hurwitz was among those accepting the award for La La Land. Hurwitz received a nomination for Best Original Score and two nominations in the Original Song category. Moana composer Lin-Manuel Miranda also received a nomination for Original Song. Kim Roberts Hedgpeth of the Film Musicians Secondary Markets Fund addressed the crowd to recognize the hundreds of AFM Local 47 musicians and music prep personnel for their contributions to these acclaimed films. In addition to MIHH recognition of California-based Best Picture and Best Animated Feature nominees, the Lifetime Contribution to Hollywood Honor was initiated in 2016 and presented to composer/conductor John Williams in recognition of his lifetime support of Hollywood’s music community and his 50th Oscar nomination. Since MIHH was established in 2011, several honoree films have gone on to win Oscars for Best Picture or Animated Feature, including Los Angeles-scored films Argo, Frozen, Big Hero 6, and Inside Out. This entry was posted in All News and tagged La La Land, Made in Hollywood Honors, MIHH, Moana, Zootopia on February 13, 2017 by admin.